When thinking about the future of money, many of us now invariably have thoughts about bitcoin. Where is it going? What role might it play in our financial lives? No matter what you think about it, bitcoin is great for starting a debate on where digital money is heading. Kenya is clearly a place where the concept of physical money started going out of style years ago – and it likely has something to do with the lack of infrastructure investments that come from the banking industry. In Kenya, the major mobile operator, Safaricom, introduced a digital payments system called M-PESA back in 2007. The “M” stands for mobile, while “Pesa” is Swahili for money. 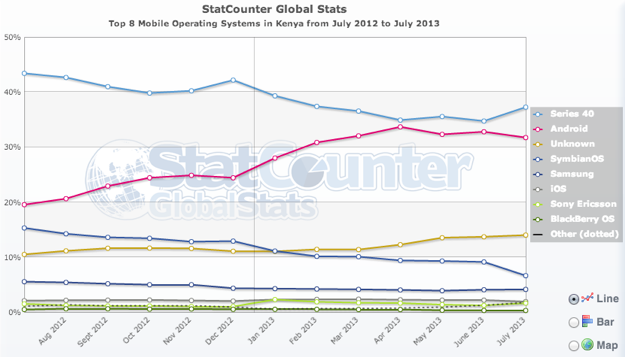 According to the official website, by 2012 M-PESA had over 14 million active users. 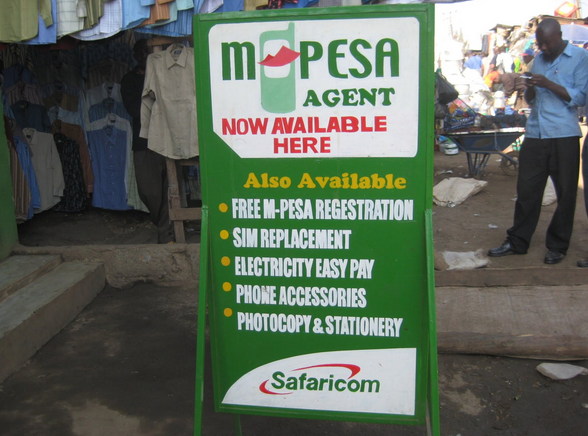 Safaricom, which has a 70% mobile market share in Kenya, lets its customers send and receive money using M-PESA. All customers need to have is a mobile phone and valid identification to get started. The system uses SMS to allow users to send, receive as well as pay bills with the platform. According to Business Daily Africa, Vodafone owns the payment service, while Safaricom licenses it from them. While M-PESA is very successful as a payment platform, it is now becoming a system for other financial services in Kenya. Users can opt for things like savings accounts and can even apply for loans with M-PESA. 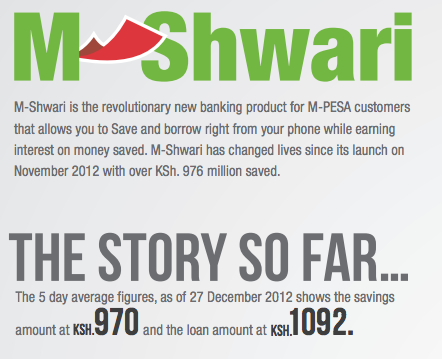 This is because in 2012 Safaricom developed a deeper financial services platform called M-Shwari. A partnership between the Commercial Bank of Africa and Safaricom, M-Shwari allows users to open savings accounts and obtain microloans at very favorable rates. As a result, Kenyans don’t have to go to a bank, and often microloans are granted in real-time. With everything being done with a mobile phone, the service has developed into a platform for saving, with a 1% interest rate granted on accounts. According to recent figures, 1.6 million people are using M-Shwari, with savings accounts by far being the most popular service. Kenyans have taken to M-PESA because traditional banking has not worked for them. 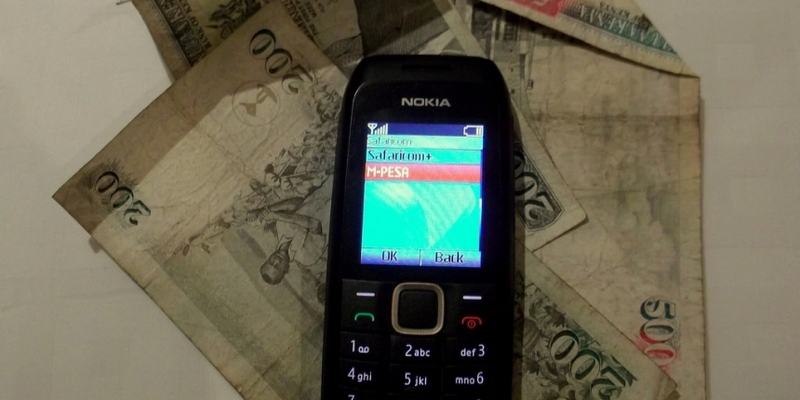 Instead of Kenyans going to banks, Safaricom decided to let banks come to Kenyans in the form of a mobile phone. In fact, M-PESA has been able to thrive even though it has had detractors within the country. The banking industry in Kenya was so concerned about M-PESA it tried to develop its own system. In the end, though, the industry had to start working with Safaricom since network effects have made M-PESA a powerful system of payments relatively quickly. In essence, since so many in Kenya were already using M-PESA, there was really no turning back on its ease of use to go with its sheer number of users. One very good reason for bitcoin is the relative inefficiency of cash money. It is a system that we have used for a long time, since the time that society decided that the bartering system was inefficient. Today we are dealing too much in the physical handling of cash: it is expensive for money to be transported, secured and maintained. Kenyans have realized this, and many there have decided using the country’s paper currency, known as the schilling, is inefficient for so many reasons. And when you think about it, they’re probably right: it is expensive for banks to handle, which in turn also costs us money to deal with. Since most of us are already using cards to transact everything, what’s stopping many of us from going completely electronic? Bitcoin could have the same network effects as M-PESA has had if a successful mobile payment platform around it were developed. We’re seeing some of that happening in the developer-friendly Android ecosystem. But for the time being, it might have to come from more open platforms for feature phones like the one provided by Kipochi. M-PESA has been able to use its network of customers to obtain clout with local banks and signing deals with the likes of Western Union to send money to places all over the world. Now, Western Union isn’t scrambing to get bitcoin customers signed up, but the M-PESA example is a sign that all it takes is user adoption for big financial companies to get on board with digital platfoms. It almost seems as if M-PESA was something that was necessary in a country like Kenya to make the usage of money easier for people who did not have access to banking services. In the developed world, there are money inefficiencies, but they aren’t faulty enough to spark massive financial change. There are places where this is not the case. M-PESA proves that if you give people access they will take advantage. And with the rise of smartphones, especially with adoption of Android in Kenya (see chart), people there will have even more options, where perhaps bitcoin or another decentralized currency will be a choice. Even Bill Gates has been impressed. Back in January, he tweeted “Kenya’s M-PESA proves that when people are empowered, they will use digital tech to innovate on their own behalf“. What do you think about M-PESA? Let us know what you think in the comments.